I don’t know why I’m here, I only know what to do. It’s time to put the chicken mask on. Creeping through the door as silently as possible I see the first guard around the corner. Breaking into a run I fling myself around the corner, punching the guy squarely in the face. He stumbles onto the floor and drops his baseball bat. I stand over him, raise my boot and bring it down into his skull. Blood spatters over the carpet covering it in jets of crimson. He won’t need the bat anymore so I claim it. Behind the next door I can hear two guards pacing around. Bursting through the door I swing the bat with such force it caves in the heads of both men at once. With both dead at the same time I gain a double score. Before I break into a grin a bullet flies through the air straight through me, one guard comes around the corner armed with a shotgun but the damage is done. I press X the restart at the front door and go for another run through. 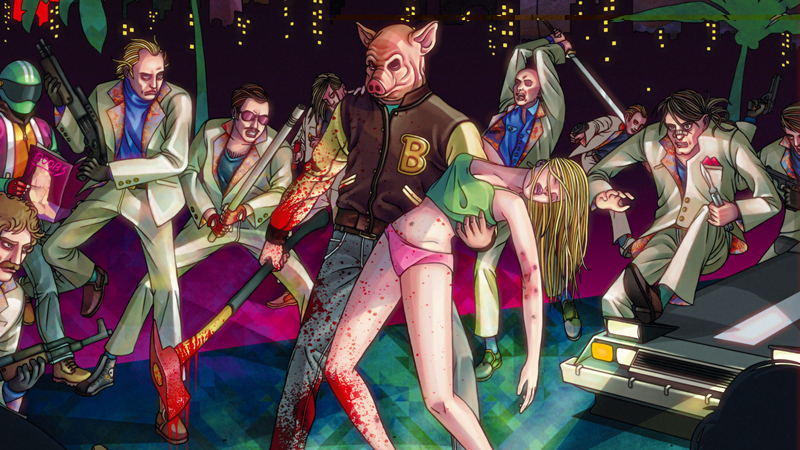 So begins each level of Hotline Miami, a game which I’ve been very curious about since it was released. It’s a game in which each level is a killing spree as your nameless character receives cryptic answering machine messages. What sounds like a simple job of ‘pick up a suitcase’ results in running around each level murdering everyone else in the level with samurai swords, shotguns or knives. There’s a wonderful sense of tension as you plan the next move, timing each phase of attack. Death is never that far around the corner however meaning an instant restart. But this isnt a blog about games (well, not entirely about games), it’s about stories and writing them. The saying goes when writing to always keep it simple. As a game Hotline Miami gets straight to the point with an opening scene in which three people in animal masks tell you that you’ve done some terrible things. Your character doesn’t even have a name, only being labeled ‘Jacket’ by fans because of his American college style apparel. You’re then flung into the first blood soaked level having been told to go and grab a suitcase and bring it back to your employer. The gang members who guard the building don’t have names either individually or as a collective. You have no idea why you’re supposed to be killing them or what exactly is in the briefcase. A little later in the game, once the flood of bodies has settled on the ground, a girl who has been locked in a backroom begs you to take her with you as she ‘has nowhere else to go’. You pick her up, like some modern day white knight, before taking her back to your car. As far as I’ve got currently she plays no further part. There are also the locations set between levels, shops and restaurants which seem to feature the same guy working behind the counter giving away free items. Jacket, it seems, never has to pay for anything and you’re never sure why. 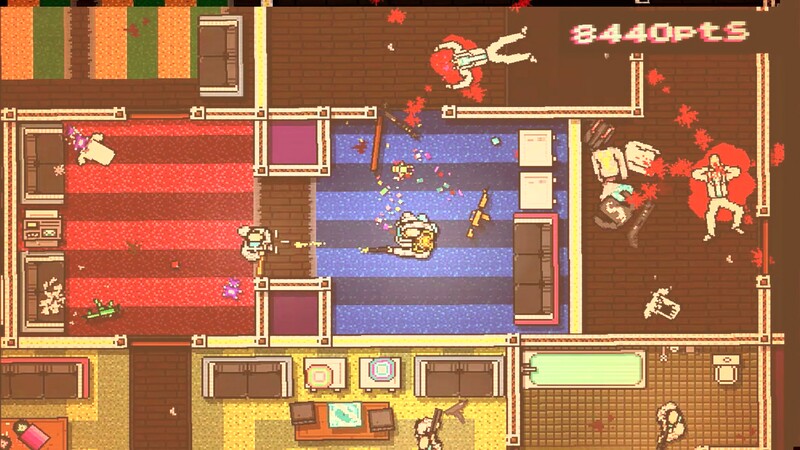 Hotline Miami draws you in with questions, only answering them as and when it wants to, never giving in to any demands your subconscious might be making for more information. To give away too much too early would strip this story of its mystique. The game’s presentation and soundtrack give it a lo-fi feel, like something contraband, something you shouldn’t have. It’s dirty under all those bright lights.